The Marvel Universe is changing. In the wake of a tragedy, Capitol Hill proposes the Superhuman Registration Act, requiring all costumed heroes to unmask themselves before the government. Divided, the nation's greatest champions must each decide how to react - a decision that will alter the course of their lives forever! 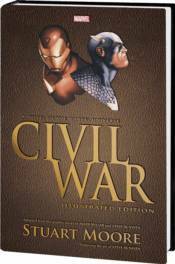 Experience Marvel's blockbuster event like never before in this prose adaptation illustrated with artwork from the smash-hit graphic novel that has sold more than half a million copies in print and digital formats!